Why Nutrition And Exercise Are The Secret To A Longer And Better Life! Modern humanity has become more physically inactive than any of its predecessors... With the advent of convenience technologies and packaged food, humanity has begun to suffer. Find out how important nutrition and exercise really are! The appearance benefits of exercise are obvious but there are many other benefits too. The benefits of exercise are so much better when coupled with a nutritious diet. Adopting a healthy lifestyle is not that simple it will take a great deal of discipline. Exercise as it exists today is presented predominantly in advertisements as a way to look younger and more attractive. It is presented on the covers of magazines promising a smaller waist, and by celebrity fitness instructors on television guaranteeing a more attractive body in a few weeks or your money back. Many view an exercise routine as a luxury that enables celebrities to look good, and long for shortcuts in the form of miracle diet pills and plastic surgery to obtain this youthful luster without all the hard work and occupation of what already seem to be busy schedules. At the same time, modern medicine constantly pushes the boundaries of science to stave off chronic diseases and increase the lifespan and well-being of the population. What every modern person seems to crave is an attractive body, youthfulness and vigor, and a longer, better life. On closer inspection, this makes sense. Modern humanity has become more physically inactive than any of its predecessors have ever been. With the advent of convenience technologies and packaged food, humanity has begun to suffer a degeneration that has produced this dissatisfaction with appearance, widespread chronic disease, and lack of youthfulness and vigor. Cool News! Getting Educators Fit! Washington area teachers could soon be learning a thing or two in free fitness classes. Falls Church-based SponsorFit is partnering with corporate sponsors to provide free exercise programs to educators in the region. Participating schools will be paired with sponsorships from community businesses, and certified instructors will visit twice schools twice a week to offer fitness classes to teachers. “Our short-term goal is to start locally with a focused group of individuals, the teachers, who can learn and deliver a healthy message to students so we can begin constructing a healthier future,” said SponsorFit’s Ray Middlelthon. Watching these amazing athletes that are soccer players during the first day of the World Cup, I can't help but think: "The way they are able to go full speed and stop on a dime, they must do agility ladder drills like it's second nature." Well having trained many a soccer player at many a level I already knew that to be true. The agility ladder drills can be applied to many sports and the routines can vary. Even though a good 30-60 second routine can be tough and taxing, there is an element of fun that can be incorporated. Really even though I have heard many a theory the agility ladder has its roots in the kids game hopscotch. Incorporate some jumps, hops, spins, and even sprints into your routine to mimic the action that you will using it for. The agility ladder, rings or even a square drawn out on the street with chalk, should be a staple of your speed, agility, and quickness workout. 1. Start by standing with the Ladder to your right and cross over with your left foot into the first square. 2. 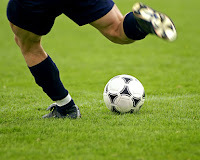 Step with your right foot behind your left foot so that it lands into the first square. 3. Then step back out of the Ladder with your left foot to land outside the second square. 4. Repeat according to the desired repetitions. When using a thermogenic product (such as Ripped Fuel, Hydroxycut, EPH 833, etc.) to stimulate fat loss, be sure to take in sufficient amounts of protein at least 20 grams every 3 hours to prevent your body from cannibalizing muscle tissue. The easiest, most effective way to do this is with a low-fat protein powder or MRP. If you frequently experience painful muscle cramps during or after your training, then you should try taking 1 or 2 grams of the amino acid taurine approximately 2 hours prior to training it has powerful and proven anti-cramping properties. As far as thermogenics or so-called fat-burners are concerned, ephedrine is still the king of the hill, but when you're deciding on your weightloss supplementation program don't overlook hydroxycitric acid (HCA). HCA is derived from the tamarind fruit and seems to work by inhibiting excess carbohydrates from being stored as bodyfat. MuscleTech's Hydroxycut is a popular product containing HCA. The chemistry of 19-norandrostenedione is telling. Basically, 19-norandrostenedione is structurally identical to a testosterone molecule right up the chain with two key exceptions: first, it is missing the hydrogen atom in the 17th position and second, it also lacks a carbon atom in the 19th position. What happens is that when the liver processes the norandrostenedione molecule it adds a hydrogen atom in the 17th position. The liver, however, has no mechanism for adding the carbon atom in the 19th position. What results is virtually a testosterone molecule missing the carbon atom. This molecule has the anabolic properties of testosterone (it may in fact have 2 or 3 times the anabolic effect of testosterone) without the level of androgenic side effects typically seen with extended testosterone use. If you're looking to drop fat and get lean, you'll benefit from 3-5 cardiovascular training sessions per week. Ideally, each session should be 30-45 minutes in duration. For fat burning, it's actually more beneficial to train at a consistent level of intensity throughout the session rather than using some sort of interval training (as with some of the machines which stimulate a series of inclines and declines). It"s also crucial for you to do your cardio training on an empty stomach otherwise you'll simply be burning up glycogen stores (sugar rather than fat). First thing in the morning is the best time for cardio training. If this isn't possible, at least try not to eat for 3 or 4 hours prior to your cardio session that way you'll be primarily burning fat stores. Will Weightlifting Help or Harm My Future Superstar? One of may favorite subjects! Many a concerned parent wonder if heavy weight lifting for their preteen student-athlete is healthy and be a hindrance to their growth. Now that we are much better informed on the subject; the answer is that a safe, well planned, strength and conditioning program can implemented for any child at any age. Heck you can hand them a 4 gram Dumbbell as soon as your next 'Peyton Manning' exits the womb! Because Mom and Dad may be busy with such things as medical bills and cribs, might be a good idea to wait a while after the blessed event. 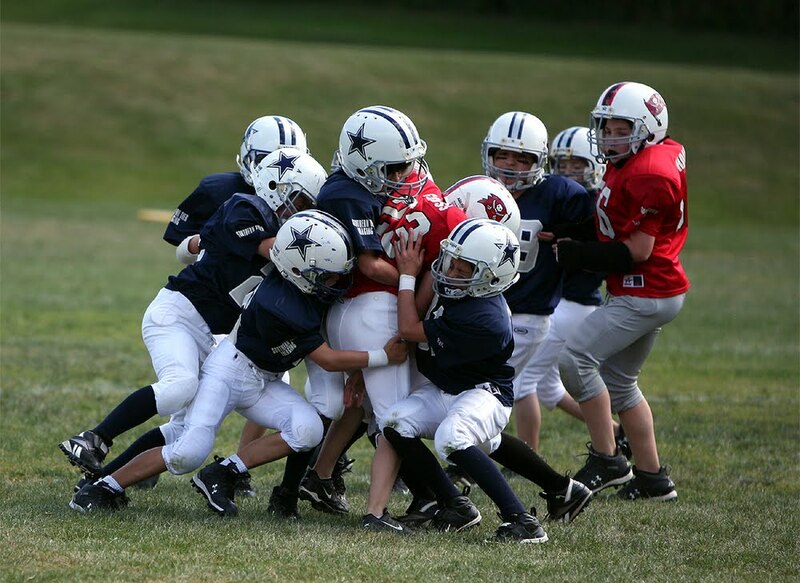 Because unfortunately so many parents will opt to not have their youngster pump iron along with athletic skill training, the child that does incorporate weight lifting with speed, agility, and quickness will have a decided advantage when he/she hits the field in the fall. I have found the key with most children under the age of 15 is to make weight training fun while challenging. I can't emphasize enough though that the primary reason for weight training for sport is to reduce or eliminate the chance of injury. With that in mind the weight training has to be progressive. Conservative in the beginning, with a gradual increase in the overall weight lifted. All strength-training activities should be supervised and monitored closely. Remember that children are physiologically immature. The primary focus, at least initially, should be directed at learning proper techniques for all exercise movements and developing an interest in resistance training. Proper techniques should be demonstrated first, followed by gradual application of resistance or weight. Proper breathing techniques (i.e., no breath holding) should be taught. Essentially weight training is no more dangerous than your child riding their bike. It is just as natural for them to swim, climb trees, and certainly more beneficial than video games. So get that future Heisman Trophy winner into the gym pronto! This is an issue thankfully that many organizations have taken seriously in the last 15 years. 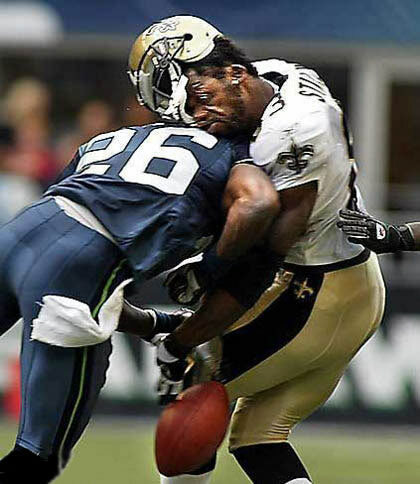 I still swap stories with some of my fellow 'Ole Heads' on how not only were not allowed to drink water during practice (football), but some genius thought it was a good idea to take salt pills during intense sport activity! Thank the creator those days are long gone. It is a forgone fact that the more active you are, the more fluids you need to take in. Let's get this straight: By fluids I mean water! Not some caffeine laced so call energy drink that gets you 'high' one minute and has you on an IV the next! Because there is wide variability in sweat rates, losses and hydration levels of individuals, it is nearly impossible to provide specific recommendations or guidelines about the type or amount of fluids athletes should consume. Monitoring urine volume output and color. A large amount of light colored, diluted urine probably means you are hydrated; dark colored, concentrated urine probably means you are dehydrated. Weighing yourself before and after exercise. Any weight lost is likely from fluid, so try to drink enough to replenish those losses. Any weight gain could mean you are drinking more than you need. Hydration should be a significant part of your meal planning. Start pounding the water days before any exercise takes place. Your active muscle is always absorbing water, so 'whaddya' think? Maybe you should have a constant intake of water? Hmmmm. This one has many uses in sport. Great for basic balance, leg drive, and core strength for football and other sports. 1. Stand behind box and place one foot on top of box, heel close to the closest edge. Hold a barbell on your shoulders. 2. Push off the box and explode vertically and drive your other knee up towards your chest. Complete the prescribed number of reps.
3. Repeat with other leg and continue according to prescribed number of repetitions. How Kobe Bryant Does it! Have to be careful here. Most of you who don't know better will assume this is another praise-crazy article about arguably the best basketball player in the game. Well I do have a lot of good things to say about Kobe, but let's focus on one aspect that many are learning throughout basketball and in the sports landscape in general: Kobe Bryant is one of the physically, brutally strongest athletes in the NBA! The scene is familiar. 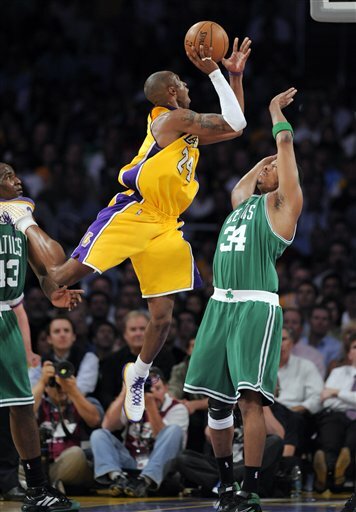 Kobe brings the ball down or gets it via a quick pop-pass from Derek Fisher on the wing near half-court. In that Triangle offense he dribbles at a 45% angle to the basket towards the top of the key steps right into the paint where he usually draws a double team. Steps back jumps into the air usually drawing contact from another strong professional athlete. Is somehow able to square his body up to the basket in the air to shoot over hands in his face and 'swish' another through and frustrate the opposition's otherwise good defensive efforts. This is outside of raw talent, and ability folks. Kobe has to work on his strength immensely to be able to consistently shoot over, under, around, and right into defenders. As it turns out Kobe is a real 'Meat-Head' (Once again that is the utmost in compliments in Gym lore in describing a professional athlete) this means that he has to take his weight training 'deadly serious' particularly in the off season. In a recent interview with Muscle and Fitness magazine Kobe summed it up in a way that should be a lesson to all of you Hoops Hotshots out there: MF: So specifically though, in the off-season, what kind of weight lifting are you doing? Is it explosive movements, like plyometrics? Kobe: Not really, it's all Olympic lifts. I do a lot of track work. MF: So like snatches, things like that? Kobe: Yeah, clean-pulls, deadlifts, Romanian deadlifts, back squats, things of that nature. Well what do you know? The best basketball player of our time (whose team is up 1-0 in the championship series at the writing of this blog) has to work at it? And includes actually stepping in the weight room? Have you noticed as well that even though Kobe has been injured in his career that he seems to be able to bounce back rather quickly? Ya think his off season training has anything to do with that? So hoopsters unlike your football brothers and sisters you have close to 6 months to get ready to play. Be ready! Hit the gym hard now! You could help your team hoist a championship trophy in March. I was faced with a very interesting case. I just finished constructing a initial 12 week strength and conditioning program (on the US Sports Online Strength and Conditioning System) for a gentleman in Ireland who plays Rugby, but at the same time in less than a month needs to improve his speed and stamina as he is vying for a position at his local Fire Department. Here in 'these here parts' Kobe Bryant, Kevin Garnett, and Rajon Rondo, might be considered the most significant athletes in the eyes of the public; but I consider any public servant whose athletic ability, strength, endurance and other factors that have a say in the saving of someone's life much more important. It required some thought and talking to the Big Man through prayer. The answer became quite simple. I suggested to him that we put him on what is generally called the 3 Day Armed Forces PFT Program This is a program designed to help members of the Military ace there Personal Fitness Tests required of most officers. Also included in the program is speed, agility, quickness, balance, and reaction training that will translate nicely onto the Rugby field as well. So the morale of the story my strength minions is that whether you are pro or a weekend warrior there are ways to approach your program that can help you not only become a better athlete; but a better public servant. In later entries I will give you updates on how our Rugby/Firefighter is speeding towards success! During your summer program, fall sports athletes, This should be your hardest and most intensive workout of the week. Here is where you will put the leg-oriented workouts with power or Olympic movements. Skip a day on your Speed Agility and Quickness (SAQ) workouts to allow for recovery and reduce the chance of injury. Plan your next SAQ workout for Saturday. June 1- Football 'Playuhs' Keep the Pedal To The Medal! Almost exactly 3 months to training camp for High School and College fall sports athletes. Little over 2 months for the pros. This should be the month where you hit those highs with the max lifts (Squats, Cleans, Snatches) and yes even though it is the most overrated exercise in sport, Bench Press is still a must if you are to impress in camp. Do your coaches a favor and ditch the so called "Energy" drinks and get used to hydrating yourself with water. It is awfully hard to drink too much water but as a general rule you High School age players should be regularly drinking 2 gallons a day. Yes I said 2 gallons. You carry more muscle that 98% of the population of your school and that muscle is sucking up water all day long. Add the intense off season training and the upcoming training camp in 100 degree heat; You can stay on the field and off the IV. Those energy drinks contain caffeine, ephedra and other hydration stealing 'crapola el grande' that will have you writhing on the ground grabbing at your calves as opposed to jacking up the freshman walk on during the 'man up' drills. 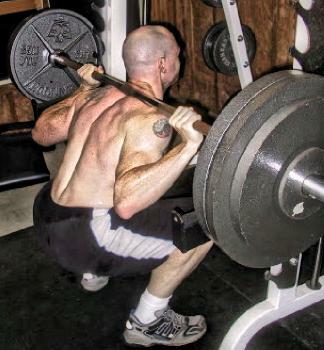 Starting Position: Grab the barbell with your body is in a bentover stance with your back flat. Explode up by pushing your feet through the floor keeping the bar close to your legs. Keep your arms straight and forcefully extend your hips, knees, and ankles. At the same time shrug your shoulders and at their highest point curl the bar up while forcing your hips forward and support the bar at chest level .